Pet Gear Easy Step III. Offers your pet a three – step boost up to the couch! 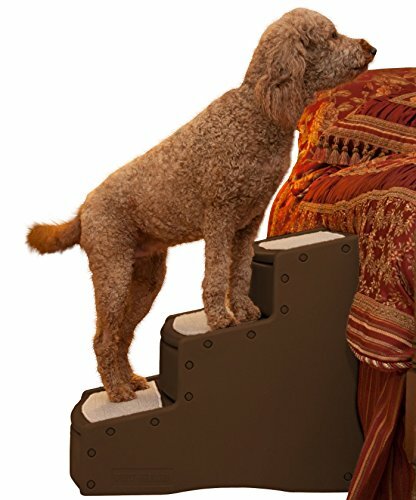 With wide, deep steps, the Easy Step III offers your dog access to too-tall places! Gives small dogs the ability to get their entire body on each platform while giving larger dogs the ability to comfortably climb. Plus, the innovative incline of each step reduces the amount of stairs needed to climb… and that means less stress on your pet! The details: Carpet tread is easy to remove for cleaning (machine wash); Easy to set up… steps snap together; Rubber grips help prevent steps from slipping on hardwood and tile floors; For pets up to 150 lbs. Measures 22 1/2 x 16 x 23. Order yours today! Want stairs with a softer feel, try the Pet Gear Easy Step III Pet Stairs, 3-step/for cats and dogs up to 150-pounds, Chocolate! The Pet Gear Easy Step III Pet Stairs dog stairs are one of the few stairs that are specifically designed to withstand the size and weight of a large breed dog. With this in mind, the majority of the people who have purchased these expressed their satisfaction with these steps. While it is designed for a large dog, the stair tread is wide enough to let a small dog stand completely on one step before taking another step. The step treads have a slight downward incline which reduces the number of steps necessary, but some of the dogs struggled with the incline at first. Some buyers felt that since it is constructed of plastic that snaps together it caused the stairs to be a little unstable. One buyer was able to remedy this by leveling the stair with some small books, which took care of the problem. A number of the pet owners chose to purchase this dog stair instead of one of the more expensive wooden ones because they were not sure that their dog would take to it and didn’t want to spend the money on a more expensive set of stairs. Once their dog became comfortable with the stairs, they were happy with their purchase.